We have been eating all of the produce we brought back from our Louisiana trip, and everything is nearly gone except for the sweet potatoes we bought in Texas. What luck! Sara Moulton, the current doyenne of American television cooks and noted cook book author, has a syndicated column in our local paper. This week her recipe was for sweet potato salad with a vinegar-based dressing instead of the usual white potato/mayonnaise mix that is so popular around the Fourth of July. I have made a few tweaks to her published recipe. She called for only a half of a chipotle, but my Southwestern background determined that I needed more pep, either with more chipotle or with hot sauce. The original was also a little monochromatic, so I added pimentos for color. Either her way or my way, I think you will find this a refreshing salad for hot summer days and evenings. In a blender, combine the garlic, shallot, chipotle, cilantro, and rice vinegar. Puree until smooth. Adjust seasoning with salt and pepper. Transfer to a covered jar and set aside. Transfer the steamed sweet potatoes to a large bowl. Pour half of the pureed dressing over the potatoes and mix well, being careful not to break up the potatoes. Set aside to cool. Brush the ears of corn lightly with the melted butter and then place on a hot grill. You can use your Santa Fe chile roasting grill for this operation. Roast the corn, turning frequently, until it is lightly charred on all sides. Transfer to a plate and cool until it can be handled easily. Hold each ear on its thick end on a cutting board, and using a sharp knife, cut the roasted corn kernels off the cobs. There will be 3 cups or more of corn kernels. When the sweet potatoes and corn have cooled, combine the dressed potatoes, corn, black beans, and pimentos. Add the remaining dressing and mix gently until everything is well combined. Adjust seasoning with additional salt, pepper and optional hot sauce. Serve warm or cover with plastic wrap and refrigerate until chilled and ready to serve. Some of my absolute favorite food and flavor combinations! Do love Texas food, Sarah M. and sweet potatoes of this genre. 🙂 Glad you had fun and safe travels! 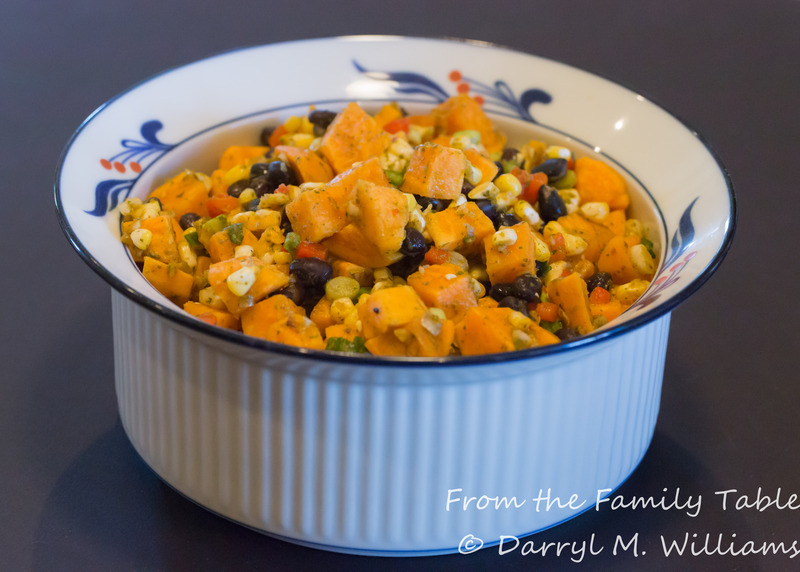 I make a sweet potato salad but have never had one with corn and black beans…I’m know I would like your colorful version.